Nissan has today revealed a bold new future for its Nismo performance arm. One of the undoubted stars of the Tokyo Motor Show is the Nissan Juke Nismo, an idea of how a premium sports version of the hugely successful compact crossover could look. With its distinctive styling Nissan Juke has redefined the highly competitive B-segment, but the Juke Nismo Concept is even more dramatic. It’s lower, wider and has a tougher stance. Even standing still, it’s clearly a performance car. 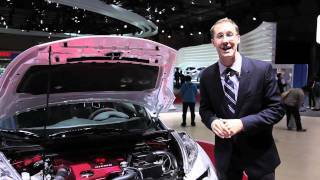 Nissan Motor Co., Ltd has today revealed a bold new future for its Nismo performance arm. One of the undoubted stars of the Tokyo Motor Show is the Nissan Juke Nismo, an idea of how a premium sports version of the hugely successful compact crossover could look. 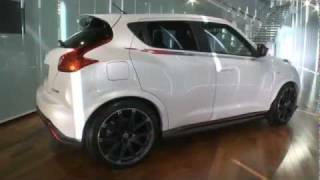 Aimed at a car-loving audience looking for a car that reflects an edgy personality, Juke Nismo Concept magnifies the standard car’s unique mix of compact car agility, coupé-like responses and SUV strength. 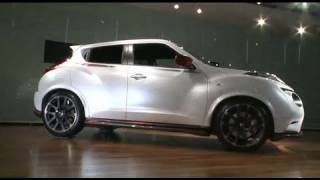 Finished in signature Nismo colours of pearl white with red highlights, the Juke Nismo Concept wears a body kit created by Nismo’s aerodynamic specialists whose skill has been honed perfecting racecar bodywork. 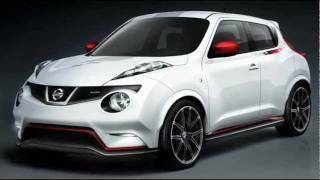 And as on a racecar, the Juke Nismo Concept body kit is designed not just to look good, but also to be dynamically highly efficient. New parts include revised lower bumpers front and rear, wider fenders and sill side skirts. The grille pattern has been changed while the tailgate spoiler has been modified by the addition of side elements to control airflow more efficiently. Even the shape of the door mirrors has been altered to enhance the car’s aerodynamic performance and reduce front and rear lift without increasing drag. This reduction in lift means the contact patch of the tyres has been increased to improve grip, which is further enhanced by the arrival of stylish new 19-inch alloy wheels. Naturally the Nismo treatment extends to the chassis which has been lowered and stiffened using proprietary parts of the sort that will be available from the expanded Nismo’s parts catalogue, while the 1.6-litre direct injection turbo gasoline engine has been uprated to deliver more power and performance. And Nismo touches can also be found in the interior of the Concept, where parts that interact with the driver’s sense of sight, sound, look and feel –­ such as the steering wheel, pedals, gauges, shifter knob and door trims – have been redesigned to provide greater involvement when driving. Further underlining the performance aspects of the car, special leather-trimmed bucket seats have been added while the importance of the tachometer means the dial and needle are illuminated in red. A feeling of enhanced sporting quality in the cockpit can be attributed to a matt effect applied to previously reflective surfaces, while the dramatic centre console – shaped to resemble a motorcycle fuel tank – has been given a metallic coating to enhance the purposeful feeling of the Concept. 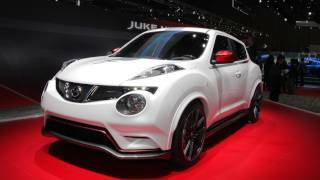 “As the Concept shows, Nismo brings new levels of individuality to mainstream Nissan cars like Juke. The future for Nismo is to develop premium sports designs for an ever-widening range of customers,” said Nismo President, Shoichi Miyatani. “Our forthcoming range of cars will be just as accessible and innovative as every Nissan product, but with added Nismo energy they will be even more fun to own and drive,” he added.